When my boss Chad came back from visiting his mother in New Jersey and instructed me to put any calls from Hayley Snow right through to his office, I nearly fell off my Aeron chair. Let me be perfectly clear: Chad Lutz is the toughest divorce lawyer on the island. Maybe make that all of Florida, not just Key West. Impulsive and lovesick are not in his vocabulary. And then a couple weeks later, she actually moved down here! Who moves to an island in the middle of nowhere to live with a guy she hardly knows? Someone who's bursting with hope and enthusiasm about love--and maybe a little lost about her future too. Anyway, she seems like a sweetheart. And boy she can cook. When she whipped up that chocolate sheet cake and brought it into the office, we all ate until we had to let our zippers out or burst. In the beginning, they seemed so happy. But isn't everyone happy in that first early, rosy glow of the new relationship before the finish starts to wear off? I could have told them both where this was going, but I kept my big mouth shut. So the question now is, do I tell her what I know? Wait until she asks? And isn't my first loyalty to my boss, even if he can be a total you-know-what? What do you girls think? 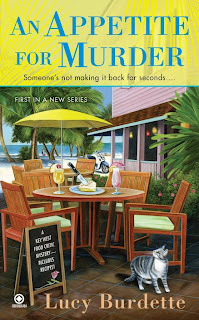 Lucy Burdette's AN APPETITE FOR MURDER is coming in January to stores near you! You can follow Lucy on facebook or twitter or Jungle Red Writers. I'm sure we'll offer all sorts of advice when we find out what you know about your boss. Until then . . . count the days until January? And thanks Shawn, hope you enjoy it! Looking forward to reading this book. Only you know what to do. Whoa, Deena! Now there's a problem. We girls have to stick together, you know. What would you want her to do if the tables were turned?